If the omnichains work then we should be able to get some great responsive movement for pitch and roll quite easily, but what about yaw? Yaw is possibly a movement that we can drop and the user wouldn’t notice, since the sphere is tethered we’re not able to spin it very much anyway, although this could change if we ever go wireless. Even without motors to rotate the sphere we would probably pick up some rotation anyway, so at the very least it would be a good idea to have a small motor with an mecanum wheel to keep this rotation under control. Again, better Yaw movement can be part of the ‘optional extras’ package to keep costs down. If some wants to pay for it why stop them, but if its not necessary it shouldn’t come as standard. A group of four motors in between the belts can also serve a double duty to help add some torque to pitch and roll when the sphere is lined up correctly. I suspect that it would be a better use of peoples money to spend it on a heave function before yaw, since that is so much more easily felt, then we can have a 3.1 DOF platform or 4 DOF if the user wants to spend the money. Normally this would just ‘rock’ but we want a sim so we add some fake movement. Underneath we have some motors, so now we can sit in the chair and we’re rotated when we add power. The motors don’t need to be very powerful, and in fact the closer we are to the center of gravity the less power we need. Obviously only a grandma would want a 1DOF simulator so we need more degrees of freedom… What does one call a 2DOF rocking chair? Or does it? 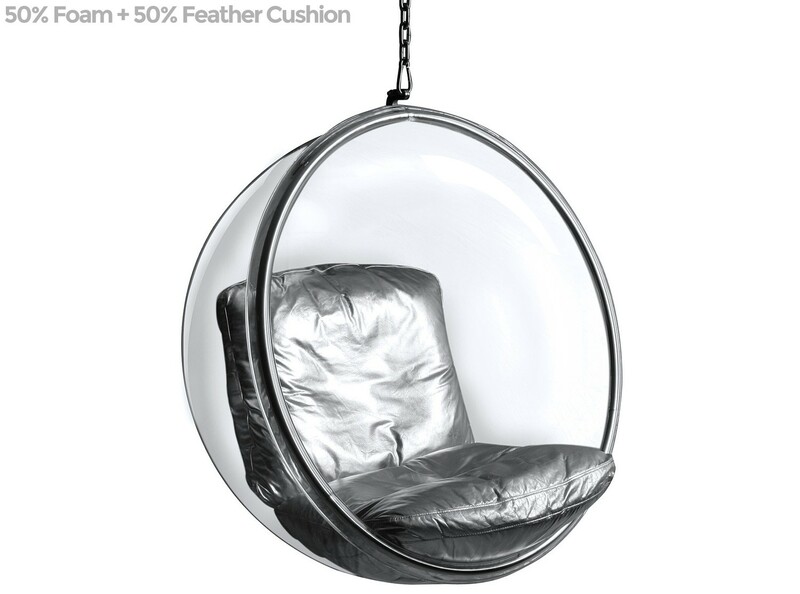 The bubble chair has been with us since the 1960s, very stylish, very chic, but is it what we want for a cheap motion simulator? Does it fit the criteria? Cheap, light, strong, easy to ship, etc etc. First it’s really a 2 1/2 DOF solution since you can’t really tilt forward very much. A hobbit could tip it back and get 3DOF but for humans it’s just too small. It may look small enough in your room but to ship it would be a major expense, it’s pretty big and of course, it’s not even big enough! It’s also very expensive and the polycarboate might not be strong enough to roll around on, it’s normally supported by the metal rim.